You’re at your PC, but can’t remember where you left your phone in your house. You can log into the ADM on your browser and it will locate where in the world your phone is on a map and show you the last date it was used. So what? You know its in the house, so that’s not that handy in this case. What you really need is help finding where you left it. ADM allows you to ring your phone for 5 minutes even if the phone is set to mute! Once you find the phone it will stop ringing as soon as you do anything on the now located device. You have your phone, but think you left your Android tablet at the office, but don’t remember for sure. Regardless where you left it, like me, you only have it secure with a pattern lock which leaves you feeling a bit queasy. You grab your phone and launch the Android Device Manager app. It shows on a map that indeed your phone is at the office. Phew, that’s a relief! You’ll be back there tomorrow, so not that big a deal, but you decide to better secure the tablet till you get there by using the Lock function to set replace the pattern lock with a strong password. You sleep easier. You’re on the road and end up at the end of the day in your hotel room without your phone. You’ve been in and out of taxis, on-site at two different client offices, ate lunch and dinner around town. Yikes! Just like you did in example 1, you fire up your PC (at least you managed to keep track of it!) and launch ADM in your browser. Good news! Your phone is sitting in a client’s office! You can go back and get it tomorrow. You already have a strong password set, so you can enjoy the evening. Bad news! Your phone is somewhere in the city you do not recognize as having ever been! You’re rightly concerned that having someone gain access to all your data is worse than having to reconfigure the phone, after all you’ve got it set for auto-backup, right? You use ADM to Erase the phone. You can take whatever steps you want the next day in regard to trying to locate the phone, filing a police report, ordering a new phone. You go to sleep irritated, but confident that your data is safe. Now for a few practical, best practice security tips to make this work as securely for you as possible. Remember there is no such thing as perfect security. However, there are things you can do to increase security particularly for the 3rd example, “Bad news” use case. Have some kind, any kind of screen lock on your device! Swipe to open? Seriously? I work from home so 90% of the time I only have a pattern lock on my devices. If you travel or work in an office, use a password to lock your device, not a pattern lock or even a PIN. When I hit the road with my devices, I set strong passwords till I return home. If you are likely to lose control of your device such that it isn’t easily retrievable in a couple minutes, you want to be able to slow down a thief or over-nosy co-worker as much as possible. This will increase the time you have to Erase the device once you know it’s really, really out of your control or ability to nearly instantly retrieve. 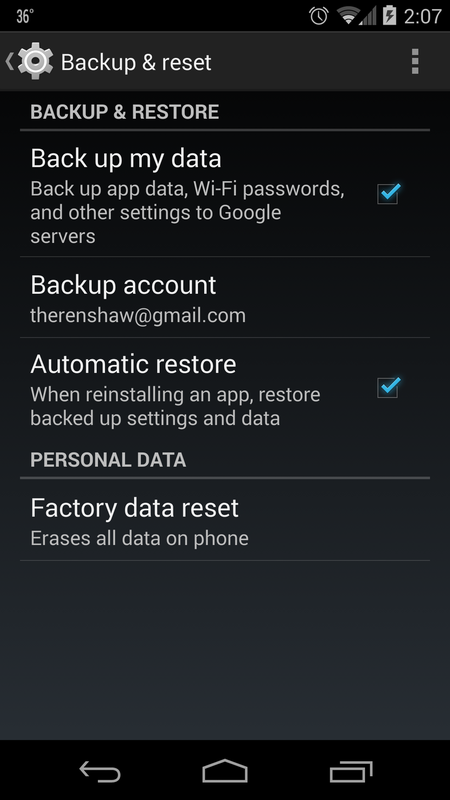 Set your Android devices to backup (screenshot below). This will significantly reduce the anxiety of remotely erasing a phone as you won’t really be losing any critical data. When you get your new device, you’ll be back up and running in a few minutes! Use the Owner Info feature and put something in there that will help kind-finders of your device contact you to return a lost device. This information is visible from the lock screen. I simply have my email address show on my phone as listing the phone number would be useless. On my tablet I list both my phone # and email address.